In this section I am going to discuss the IPv4 and IPv6 headers as they relate to the 1.1.d section, explain IP operations. Then we will list out details you should know before proceeding to dive into them in later sub sections. I highly recommend memorizing these fields in the header and I have even made flash cards for you. The IP header is 20 Bytes long (normally) and a max of 40 Bytes with options (rare), with various peices. Time To Live: How many times this IP packet has been routed; Each router decrements this once. (They can choose not to). It is also useful for preventing routing loops within a network because if a router receives a packet with a TTL of 1, it will drop it and send an ICMP time exceeded message to the source. 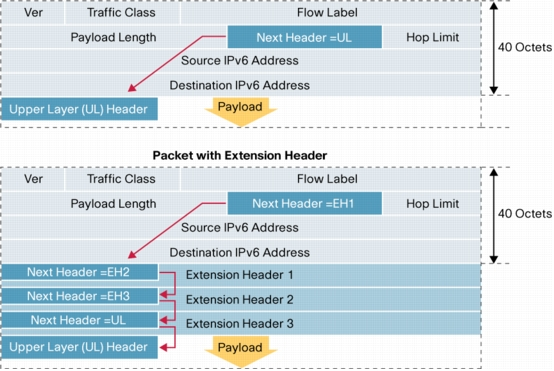 The IPv6 header is a fixed 40 byte long header, extensions are optional but not a part of the actual header. Traffic Class: This is the same field as the DSCP filed in the IPv4 header, used for QoS (8 bits). A sub type of this field is the explicitly congestion notification fields for notifying end hosts of congestion along the path. Hop limit: Same as the TTL in an IPv4 packet, used to prevent routing loops. I looked around for many different sources, and even in the Official Cert Guide Books, but nothing really compares to the notes from the two blogs below. This one is more of a comparison, but still serves well. Previous Previous post: CompTIA Linux + LX0-104 Flash Cards!